A six-year old ‘Carol Mackie’ daphne in bloom. Daphnes have a reputation as finicky, often short-lived shrubs. 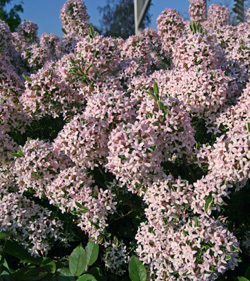 These slow-growing, deciduous, semi-evergreen or evergreen shrubs with fragrant flowers are native to Europe and Asia. There are numerous species, hybrids and cultivars of this group in the thyme family (Thymelaeceae), but one that stands out both for its foliage and cold hardiness is Daphne xburkwoodii* ‘Carol Mackie’. This variegated selection, probably the most popular daphne in the US, is a genetic mutation of D. xburkwoodii ‘Somerset’ and was named for the woman who discovered it in her New Jersey garden in 1962. 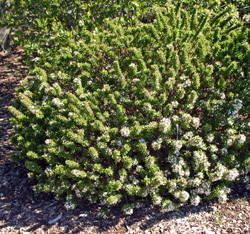 It is an attractive, low-maintenance shrub that can be used as a specimen plant, or planted in groups where space permits. ‘Carol Mackie’ grows 3-4 feet tall and at least as wide. Typically it has a dense, round, mounded form. The small, narrow, oblong leaves edged in gold to creamy white remain fresh-looking throughout the growing season. The variegated leaves are edged in gold to creamy white. Daphnes bloom in spring with a profusion of small pink to white flowers. In mild climates it is evergreen, but the leaves eventually fall off in colder climates. 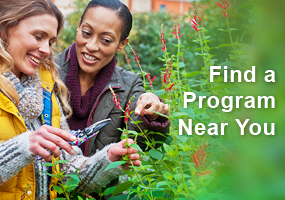 It may be slow to leaf out in the spring, and even plants growing adjacent to each other may leaf out weeks apart. It is often rated as hardy in zones 5-9, but has survived in Wisconsin gardens in zone 4 for many years, so is definitely hardy in zones 4-9. In spring the plants burst into bloom from pink buds with a profusion of small, pink-tinged white flowers that are highly fragrant. Masses of tubular, star-shaped flowers are borne all along the terminal shoots. The scent can be almost overpowering from larger plants, so these can be located a distance away to still appreciate the fragrance. 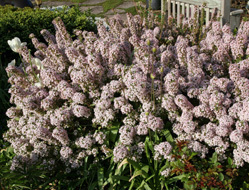 There may be a second, much smaller flush of flowers in late summer or early fall. The flowers may be followed by tiny red fruits (drupes) in the fall. Masses of star-shaped flowers are produced in abundance. Daphnes do best planted in sun to part shade in any type of well-drained soil. Mine is growing in unamended clay, but on a slight slope for better drainage. 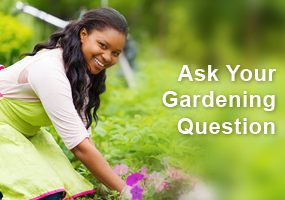 They resent transplanting, so it is best to site them properly to begin with. Once established, it may be impossible to successfully move a large daphne. Many daphnes also have the annoying habit of dying unexpectedly without any apparent reason. Daphnes are susceptible to root rot, so need good drainage to avoid this problem. Although they like consistent moisture, they are drought tolerant once established but may shed many leaves in dry summers. They have few insect pests, but may be infested with scales or aphids. Daphnes are evergreen in mild climates, but often lose all their leaves in winter in colder areas (L), with a new leaves coming out in spring (R). The Burkwood daphnes are susceptible to splitting under heavy snow loads. They are supposedly resistant to deer, but those animals may browse the stems in the winter. Minor pruning by deer should not harm most plants, and may actually be beneficial. Heavy snow can be an issue, with the weight breaking branches or splitting open the whole plant, leaving an open center. 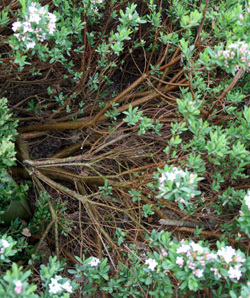 ‘Carol Mackie’ is particularly prone to such damage, and will benefit from regular pruning. Although tradition advice was to never prune daphnes, many experts now recommend hard pruning of many types – and especially ‘Carol Mackie’ – to keep the plants in good shape. One recommendation is to treat this plant like a forsythia, removing up to ¼ of the old growth annually after the plant has matured. Others suggest heading back after blooming to stimulate growth. 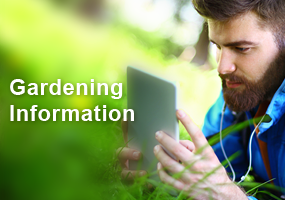 Be careful when pruning, as the bark is susceptible to tearing. Also, resist heavy fertilization as this will promote soft growth that’s susceptible to damage. 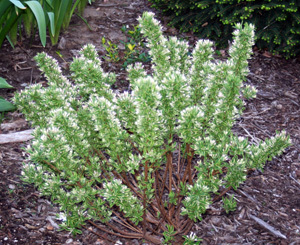 Occasionally variegated plants will produces shoots with green leaves. These should be entirely removed so the plant does not revert back to the more vigorous green form. There is also the cultivar ‘Briggs Moonlight’ with reverse variegation (white leaves edged in green) that was a sport of ‘Carol Mackie’, as well as several other named variegated cultivars that are not commonly available in the US. Daphnes can be propagated from stem cuttings. Getting cuttings to root is very challenging, however. Softwood cuttings can be taken in early summer or hardwood cuttings in late summer. They may take up to a year to root. *The Burkwood daphnes are a cross between D. cneorum and D. caucasica, originally made by Arthur Burkwood. They tend to be more vigorous growers than the species, but with softer woody growth that seems to weaken with age making them more prone to breakage. I grew two Carol Mackies in northeastern Mass about 10 yrs ago. They were at the top of a gently sloping yard, so pretty decent drainage. They were in a very sunny location, so I watered a few times per week. They were absolutely gorgeous! ! I’ve since moved further south, just north of Boston. I acquired two small CMs in 1 gal pots and look forward to re-creating two more gorgeous shrubs — fingers crossed!